It is my understanding that Mr. Midshipman Edward Stewart has, in his free time, been making efforts to study for his Lieutenant's exam. He has been spotted all over the ship with his worn copy of the 'Young Sea Officer's Assistant' in his hands or tucked in his pocket. The pages are nearly gray with wear and age. Young Mr. Hanmer, who is a Master's-Mate and fancies himself the 'King' of the gunroom, tho' he is the same age as most of the fellows there, has made great sport of poor Stewart. Mr. Stewart's family sent him an older copy of the 'Young Sea Officer's Assistant' from '73 I believe, and Hanmer has not allowed Stewart to forget it. This morning, Hanmer approached Stewart and clapped him on the shoulder and says, "Edward, I'm certain you'll make a fine Lieutenant... during the American Revolution!" 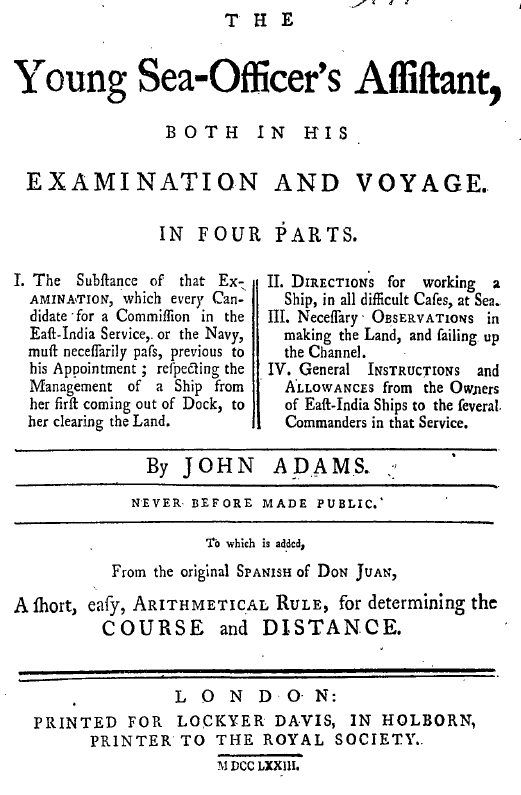 You may have a look through Mr. Stewart's poor old copy of 'Young Sea Officer's Assistant' HERE.